What Happened to Ford's Magic Skyway? From the Ford Mustang to "It’s a Small World," the 1964 World’s Fair in New York was home to many attractions whose legacies would extend far beyond the Fair's gates. 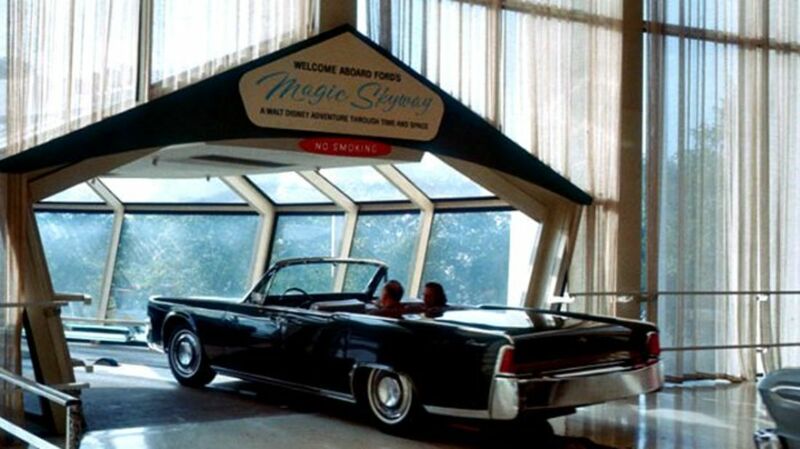 One that didn’t: Ford’s Magic Skyway. Designed by Disney Imagineers, the ride entertained visitors while simultaneously exposing them to new vehicles fresh off the Ford assembly line. The cars were affixed to a track which took riders on a journey through time, all the way back to the age of the dinosaurs. After watching dinos peacefully graze on vegetation and witnessing a battle between a stegosaurus and a tyrannosaurus, riders saw humans create fire and invent the wheel. This, of course, is where Ford comes in. From the invention of the wheel, folks aboard the ride traveled along the “Highway in the Sky” to “Space City,” a futuristic town full of Ford creations. “This is Walt Disney speaking. Our Space City is a distant dream. But all such dreams must begin in the minds of men. Men like the scientists, engineers and automotive designers of Ford Motor Company. I hope you enjoyed our show and your ride on The Magic Skyway in a new Ford product as much as I've enjoyed the Fords I have driven through the years. Now step out and see a world where tomorrow is being created today." But Ford executives passed on moving the Magic Skyway to Dearborn, choosing only to keep “The Auto Parts Harmonic Orchestra,” a collection of real, working musical instruments made from Ford parts and pieces. And though the pavilion at Disneyland didn't pan out either, Disney did salvage two things from the ride: The dinosaurs found a new home in the Primeval World diorama along the Disneyland Railroad, and the track system concept was used to create the WEDWay PeopleMover ride at Disneyland just a few years later.